Screen 1: In summing tracks through an analogue console, the sound comes from signals being processed both dynamically through the circuitry on each channel and aggregately in the circuitry of the mix bus. It may look like a humble point upgrade, but Studio One v3.2 brings with it some significant innovations. PreSonus recently released Studio One version 3.2, with numerous new features: some useful, some even better than that. This month, I will discuss only a few of what I find the most significant of the new additions. The biggest addition being touted by PreSonus is what they are calling Mix Engine FX (MEF). To me, this term seems a bit misleading, since the whole point of the feature is that it is not applied only to mixes. A Mix Engine effect is an audio processing resource that can be accessed by individual channels as well as mix buses. It looks like a special bus plug-in, but works as a separate plug-in on both the bus and on each individual channel feeding it. The original idea was to satisfy the demand for the sonic benefits of analogue summing. 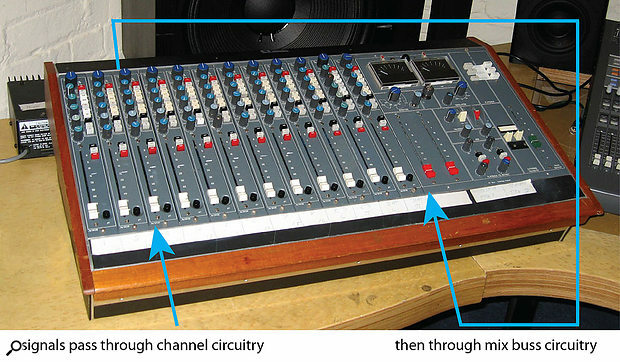 In analogue mixing consoles, sounds are shaped by the circuitry on each channel, as well as by the audio characteristics of the summing buses. In short, to get the effect of analogue summing in a DAW, you must apply analogue processing emulation everywhere — on each channel and mix bus — as is shown in Screen 1. A drawback of existing console emulation plug-ins is that they must be inserted separately on each channel, as well as on mix buses. This makes setting up and changing settings tedious. In contrast, when a MEF, such as the Console Shaper included with version 3.2 (Screen 2), is inserted on a bus channel or the main mix bus, it is automatically instantiated on each channel individually and on the bus. 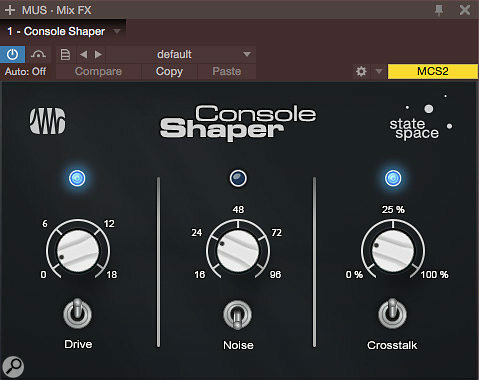 Screen 2: The Console Shaper plug-in, Studio One’s first Mix Engine effect, allows the user to adjust how ‘hot’ signals are passing through it, how much crosstalk there should be between channels, and how much noise should be added. This processing is applied to each channel and to the mix bus into which the plug-in is inserted. Several important things are going on here. One is that analogue console circuitry (and Console Shaper’s emulation) is non-linear, reacting differently to loud and soft signals. Another is that analogue mixers suffer crosstalk: signal bleed between adjacent channels. The MEF architecture allows for this sort of interaction, too, as is seen in Console Shaper. It is easy to see possibilities for MEFs that go beyond Console Shaper. 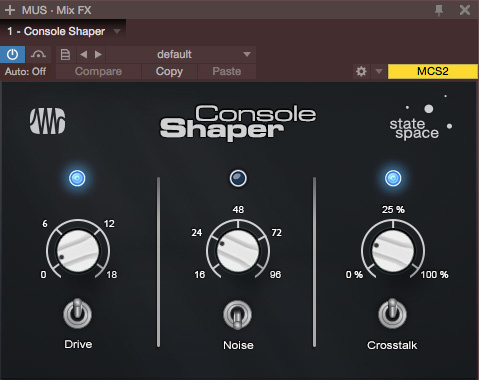 Obviously, you can have Mix Engine FX that emulate different consoles, but MEFs can carry out tape emulation, or indeed any other kind of processing you might want to apply individually and collectively across the (mixing) board. Several software houses are already working on creating MEFs, not surprisingly including emulation-mongers like Slate Digital and Softube. Using a MEF is easy — if you know where to look. You won’t find MEFs in the standard Studio One browser effects list, but above those in the Effects pane, in a folder just below the FX Chains folder. Locate the MEF you want (which, at this time, just means Console Shaper) and drop it on the Mix FX section at the very top of the channel strip for a bus or the main mix. The plug-in opens as any other does when inserted, but adjustments made on it affect all instances of the processing. In v3.2, Studio One joins the ranks of DAWs that enjoy the eminently useful but archaically named VCA groups feature. Many analogue consoles contained actual VCAs (voltage-controlled amplifiers), but a software environment has no voltage control of any sort, so ‘VCA groups’ or ‘VCA faders’ in DAWs actually provide ganged digital gain control over all of the channels assigned to them. When a channel is assigned to a VCA group (or ‘VCA channel’ as PreSonus even more inaccurately call it) in Studio One, the group fader controls a gain stage on each channel inserted after the channel’s fader and automation. This means that controlling signals in a VCA group does not submix or reroute them. It also leaves fader settings and automation on a channel untouched, only scaling (changing the gain of) the resulting channel signal. Screen 3: The difference between fader groups, submixes and VCA groups. In the fader group (a), the channel faders are locked together, and adjusting one changes them all. In a submix (b), individual channels are unaffected, but their signals are summed, with a submaster fader to control the level of the whole mix. In a VCA group (c), each channel is followed by a gain stage, with ganged control by a VCA group master fader. A VCA group is useful in a scenario where, for example, guitar and keyboards double a riff through a section, which makes the doubled riff too loud in the mix. You could go to the guitar and keyboard channels, however many they may be, and add automation to each to lower the level of the doubled riff; but you could also assign those channels to a VCA group and then add the desired automation to that, all the while leaving the channels routed and automated as they were before. Trim automation of this sort is a prime use of VCA groups. Submixing to a bus channel, on the other hand, is preferable when you want to compress an entire drum mix, for instance. Screen 3 illustrates this difference. Screen 4: The small, blank box just below the channel meter is actually a drop-down menu of available VCA groups. Creating a VCA group is the same as making a bus channel: either select the member channels, right-click, and choose Add VCA for Selected Channels; or choose Add VCA Channel, and assign channels to it using the drop-down menu that appears when you click on the box immediately below the channel meter and fader, as in Screen 4. All in all, version 3.2 is much more than just an incremental upgrade. The addition of Mix Engine FX is a significant innovation, and many improvements to existing features, or additions of familiar features like ganged-gain (‘VCA’) faders, further improve Studio One’s already fast workflow. There are quite a few more features added in version 3.2 than I have room to touch on here, many of which I frankly haven’t yet mastered. I found mastering the new features to involve a bit of effort, including experimentation and reading of forums and other sources to clarify unclear descriptions of some features in the documentation, and to fill in undocumented details and features. But the Studio One community is clever and helpful, which will enable us all to reap the greatest benefits from this welcome and substantial new version. Screen 5: The Loop Follows Selection command is in Transport / Options sub-menu. Also note the Set Play Start Marker command at the bottom of the image.Version 3.2 improves the functionality of existing Studio One features in numerous ways. Here are just a few of them. Switching between tools in Studio One has always been easy, but not needing to switch is even easier. This is the premise of a smart tool, which PreSonus have added in v3.2. When the cursor is over the bottom half of an event it shows the arrow tool; over the top half it shows the range tool, and at the boundary it becomes a trim tool. There’s no longer any need to select a razor tool, either. Separating a selection into its own event is now as easy as double-clicking it. In fact, double-clicking in the middle of any event, selected or not, splits it at that location. 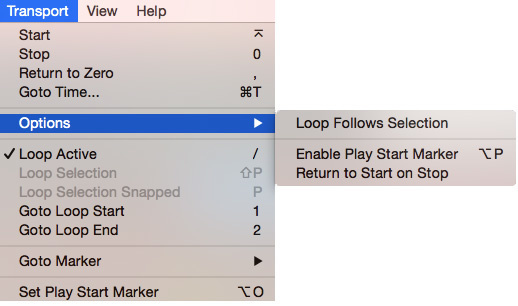 A new Loop Follows Selection option eliminates another keystroke. With this option enabled, when a selection is made, the loop locators are set to its boundaries. If you can’t find this feature, it is tucked into the Transport / Options sub-menu. A new Play Start Marker finally makes the selection, loop and play cursors independent of each other. The shortcuts to enable (Option/Alt+P) and place (Option/Alt+O) this marker are quick at hand, making it easy to drop the play start marker spontaneously while on the fly or when it is desirable to preserve the selection. A new zoom mechanism makes it easier to zoom in for an edit and then jump back to the previous zoom level; simply Option/Alt-Shift-drag to zoom in and Option/Alt-Shift-click to zoom back out. Another nice comping addition is the ability to right-click a range copied from a subordinate layer to the active layer and replace that range with the same range from any other layer having material there. Flipping through six versions of a difficult lick to see which take sounds the best in context is quicker and easier with this mechanism. Small but annoying stumbling blocks have been addressed. Before, it was not possible to make a selection on a layer because it was always interpreted as a comping edit. Now, selecting the range tool enables selections on layers that are not automatically comped. Sliding a crossfade was difficult to do when zoomed out; that has been made easier now. Celemony Melodyne Essential, which comes bundled with Studio One Professional, has now been upgraded to handle polyphonic material.